Above: Select the required Marine Engine builder by using the initial letter of the Name eg: Hepple or Rennoldson. It was an engine from the Birmingham firm of James Watt that powered the EAGLE (sister to the PERSEVERENCE), used as a tug on the Tyne from 1816. 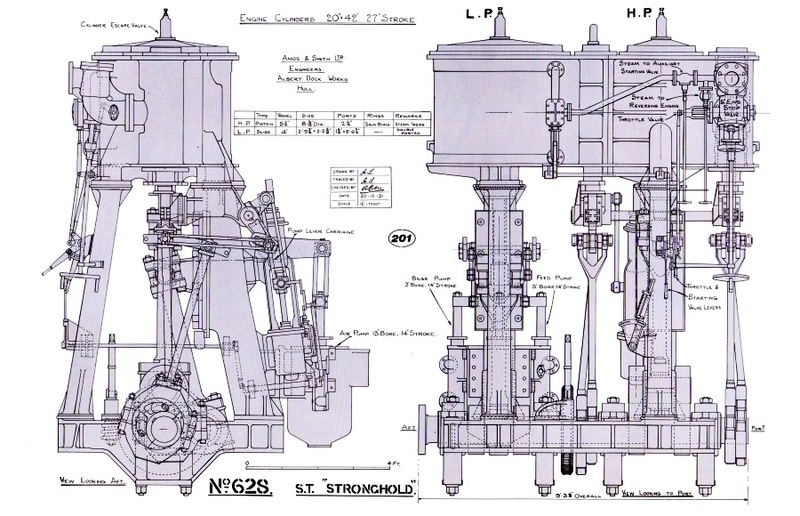 The engine builder for the second Tyne steam vessel, the SWIFT, is however unknown, however it is unlikely to have been a Tyne built engine. Tyneside enterprises at that time did not produce engines. General machine and mill work had been carried on since 1747 by the Gateshead Iron Works, afterwards Hawks, Crawshay & Co and from 1809 at the Walker Iron Works of Losh, Wilson & Bell. Robert Hawthorn commenced work at Forth Banks in 1817 and George Stephenson nearby at South Street in 1823. Both of these latter two firms were to concentrate on railway engines, especially after the success of Stephenson’s “Rocket” in 1829. For many years afterwards Newcastle engineers remained the sole producers of locomotive engines for the world, only meeting serious rivalry in the 1880s. "King Coal" had driven the development of the railway engine for transporting coal from the mines to the rivers and it was coal again that drove the requirement for tug boats. It was the associated business of building engines for the early river steamboats and tugs that laid the basis for the significant marine engineering businesses on the Tyne. Fifteen vessels were used for towing on the Tyne by 1822 and Jonathan Robson of Gateshead had engined six of these and Hawthorns of Forth banks another four. Hawks of Gateshead made the 14hp engine for the SAFETY in 1821 and three years later the same works built the 30hp “grasshopper” engine for the NEWCASTLE. By 1820 R & W Hawthorne was producing marine engines, followed a year later by Hawks, Crawshay & Co. In 1830 TD Marshall of South Shields started building and fitting out steam tugs. Smaller firms sprang up all along the river and many of the shipbuilders added engine shops to their shipyards and produced their own machinery. Hawthorne’s and Stephenson’s were followed by Morrison & Co at the Ouseburn; Thompson & Co at Spring Gardens, Newcastle; Thomas Clark & Co at Elswick; John Shaw & Co at Low Walker; Black, Hawthorn & Co at Gateshead; Wallsend Slipway & Engineering Co and the North-Eastern Marine Engineering Co at Wallsend. At least 360 steam vessels (not all tugs) were built on the Tyne before 1850 and most were paddle driven. (There had been many experiments with screw propulsion, but this did not become a serious option till after 1854.) North Shields (with 149 vessels), South Shields (with 78 vessels) and Gateshead (with 63 vessels) were the principal centres for tug boat building at this time. Eleven Tyne yards each built nine or more steamers before 1850 and a further eleven built four or more. However in all there were some sixty builders that built at least one of these early steamers. In the 1860s there were over 250 steam tugs on the Tyne and almost 100 more on the Wear and Tees. All these tugs would have engines almost identical to the type of those fitted in 1820. These early engines devoured coal which usually restricted the operation of the tug to the rivers. However many tugs made longer trips out to sea “searching” for ships to tow to the rivers, with coal piled on the decks until they were almost awash. For a brief history of the development of tug construction and associated engine design, click HERE.